Earning an online bachelor’s degree in psychology can help students better understand the human mind, human interactions and behaviors. An online degree program can assist students in enriching the lives of others while formally preparing them to enter the workforce. Prospective students looking for more information on online bachelor’s in psychology programs can find answers here, with breakdowns of the best degree programs in the country, major educational milestones and potential career opportunities following graduation. Students searching for the best online bachelor’s programs in psychology don’t have to start their program research from scratch. This list ranks online programs that offer a bachelor’s degree in psychology by factors most important to students, like graduation rates, the student-to-teacher ratio and the cost of tuition. 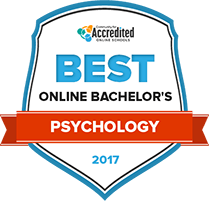 Find out which online psychology bachelor's programs rate the highest for 2017. These factors were assembled for each school and rated using a peer-based-value (PBV) calculation. PBV compares the cost of a program to the cost of other programs with the same (or similar) qualitative score and cost. PBV denotes the overall value or "bang for your buck" of a college or degree program. At Lesley University, students who earn a bachelor’s degree in psychology don't just learn the discipline from a theoretical perspective. Instead, the school puts a strong emphasis on experiential learning and to that end, the department offers research and lab experiences to students. In addition, to successfully earn their degrees, students are required to participate in an internship that provides professional experience that trains them to work in a career related to human behavior. In the classroom, students learn topics such as individual development, cognition, abnormal psychology, and neurobiology. As a result, students leave the program with a strong understanding of psychology theory and the tools to put it into practice. Indiana Wesleyan University provides a psychology education that is based on both the theoretical framework of the field and the Christian principles that the school was founded on. As a result, students who earn a bachelor’s degree from the school not only learn the concepts that guide the field, but also how psychology can be used as a tool for service. In addition, the program focuses on important practical skills that students need to work in the psychology profession, including research, critical thinking, interpersonal, and problem solving abilities. The coursework in this program includes topics such as learning and motivation, social psychology, counseling, personality, psychopharmacology, and art therapy. Prescott College is a private liberal arts institution founded in 1966. Current offerings include resident and limited-residency degree programs at the undergraduate and graduate levels. Limited-residency programs are designed to accommodate students with family or work obligations. The Psychology and Human Development Department offers bachelor degree programs in psychology at both residency and limited-residency formats. Students are encouraged to develop their unique study plan focused on educational and career goals. The four-year degree offers students a choice of concentrations in critical psychology, counseling, ecopsychology, holistic health & wellness, expressive arts, gender & sexuality studies, or psychology/human development. New York University, founded as a private institution in 1831, has grown into one of the nation’s largest schools. Its original enrollment of 150 has swelled to today’s 50,000 students attending programs in New York City, Abu Dhabi, and Shanghai. NYU’s psychology undergraduate degree has become the most-popular program at the College of Arts and Sciences. A minimum of ten, four-credit courses are required for the major, including Introduction to Psychology, Statistics for the Behavioral Sciences, and Advanced Psychological Statistics. In addition, students take courses in natural or social sciences and at least one laboratory course. Entering students who received a four or five score on the AP exam in psychology receive automatic credit for the introductory course. Established in 1888 in Ohio, Tiffin University offers campus-based and online degree programs to more than 3,200 students. Enrollment increased by 105% from 2005 to 2015. The university’s Bachelor of Arts (BA) Degree in Psychology prepares students for careers in non-practitioner fields as well as for admissions to psychology graduate degree programs. In addition to completing comprehensive, well-rounded core studies in psychology (24 hours), students choose from concentrations in experimental, addictions counseling, or human services. In their first semester, students take a seminar dedicated to time management and the development of study skills. Saint Mary-of-the-Woods College, a Catholic, coeducational liberal arts college, was founded near Terre Haute in 1840. Today, the Woods offers online or campus-based undergraduate degree programs accredited by the Higher Learning Commission. Programs are open to students of all faiths. The 120-credit online undergraduate psychology baccalaureate program is based upon 43 credit hours of courses in the major. All degree students are required to complete a course in ethics for the helping professions. An additional six credits are required in psychology electives. Undergraduate students may also declare a 21-credit psychology minor. University of Utah, founded in 1850, is a space-grant research university in Salt Lake City. More than 23,900 undergraduate students attend the university, pursing degrees online or at the 1,534 acre campus. The Utah Department of Psychology offers a bachelor degree that incorporates curriculum in clinical psychology, health psychology, cognitive neuroscience, personality psychology, and developmental psychology. The four-year major is comprised of 12 courses, including required core studies in developmental, cognitive, clinical, social, and behavioral neuroscience areas. The program begins with introductory studies in psychology and research/statistical methodologies. Applicants are assisted along the way by the Psychology Advising Center. The University of Alabama became the state’s first public college when it was established in 1831. A record high of more than 37,000 students enrolled in 2015. "The Capstone" is the nickname applied by students, faculty and graduates. The university’s Department of Psychology offers four-year undergraduate programs leading to either a bachelor of arts (BA) or bachelor of science (BS) degree. The psychology BA degree program offers students studies in pre-medical, pre-physical therapy, pre-law, and pre-occupational therapy. The BS degree program includes studies in human growth and potential, and the biological bases of behavior. Both degrees require 120 credits for graduation. Judson College offers a bachelor’s degree in psychology which may be a worthwhile pursuit for any student with aspirations of achieving a counseling-based career. The small student-to-faculty ratio at Judson College allows students to be certain they will receive the academic and emotional support that will ensure the successful completion of their education. Judson College also helps students to learn the importance of peer engagement through close-knit campus residence communities. Student-run clubs and organizations are also available to fill the hours between classes; organizations include intramural sports, mentoring programs, and special interest groups. As psychology is a widely applicable field of study, a student who completes a bachelor’s degree in psychology with Buena Vista University will have a large selection of career paths to pursue. Buena Vista’s curriculum focuses on the analytics of cognition and human behavior, providing students with the learning necessary to succeed in a career of mental health counseling, corrections, or even animal behavioral studies. The programs offered at Buena Vista are intensive and involve a high level of hands-on work, giving students the greatest opportunity to fully understand their field of choice. Bachelor’s degrees in psychology are becoming an increasingly popular option for online students. The search tool below can assist students in finding the online program that best matches their educational needs, sorts every school that offers an online psychology bachelor’s degree by factors from acceptance rate to public versus private status and financial aid offerings. From researching programs to filling out applications, going to class and walking at graduation, earning a bachelor’s degree is no small task. This timeline helps students get organized and successfully navigate through a bachelor’s level psychology degree program from start to finish. Check out some of the common milestones students should aim to meet as they earn their undergraduate psychology degree. Although most universities do not require a separate formal application process into their online bachelor’s degree programs for psychology, prospective students should still prepare to fill out their general college and university applications efficiently. Here are some tips to keep the application process running smoothly. Even after shaving done their research and chosen their top schools, the process of getting into the right online psychology program has just begun. Track each school’s online application deadline date, and keep each application organized separately, as many schools have different requirements. Most ask for basic information such as the student’s demographics and extracurricular activities they participated in during their high school career. All official, sealed transcripts from completed high school or former higher education programs must be sent to prospective schools. Psychology students should be sure to include any national test scores such as the ACT and SAT and grades from advanced placement courses, especially those related to psychology. These components may be used to determine placement certain courses and may affect overall acceptance in competitive online programs. Write and revise required student essays on academic and career objectives. This is a great opportunity for the student to include their interest within each individual online psychology program, or pinpoint a school’s specializations. Most schools will provide a writing prompt and content requirements that must be included in your essay. Open an account and complete a financial aid application at the Free Application for Federal Student Aid (FAFSA®) website. Explore other financial aid opportunities available specifically for students seeking a bachelor’s degree in psychology, or an online degree program. Observe and meet application deadlines and be sure to include the school code that is providing your future online psychology program, listed on the site. Assemble a packet containing each formal application to the schools of choice. When applying to multiple psychology programs, it’s easy to lose track of or confuse requirements and deadlines. Some admissions into online bachelor’s programs are very competitive, and missing a deadline will likely result in rejection. Prospective students will begin receiving offer letters from colleges and universities that have accepted their application up to two semesters prior to enrollment. Making a choice with multiple offers can be difficult, and psychology students should evaluate each school’s online program standards, curriculum and post-graduation opportunities before accepting an offer and enrolling. Depending on the school degree requirements and the amount of time a student can commit to completing their online degree, the average bachelor’s degree in psychology takes around four to five years to complete. Accelerated and self-paced courses are often a component offered through online psychology programs, and can provide the fastest tracks to entry-level psychology professions. After determining which path to pursue, take a look at the major milestones for the first half of a bachelor’s level psychology education pinpointed below. Academic advisors are typically available in every department, but online students may need to make extra efforts to meet and work with their psychology advisor. Advisors can recommend courses, professors and help students map out and stick to a graduation plan. Often times meetings can be done remotely with online students. Psychologists are required to convey their advice in a proactive and professional way, to both their clients and their peers. This required high-level communication skills. Bachelor’s level psychology students are encouraged to enroll in basic communication courses in the first two years of study to improve this skill set. All career paths in psychology require an understanding of writing and research. These skills can be used when psychologists are conducting their own experiments or interpreting data from other professionals in the field. First and second year students enroll in their school’s basic professional writing and research classes. Though much study during the first half of a bachelor’s psychology program is restricted to core credits rather than electives, students will begin taking introductory courses in their field towards the end of their first and second years. These classes will give students a basic overview of the concepts, principles and history of psychology as a profession, and are often prerequisites for upper-division psychology courses. In the final two years of a bachelor’s level psychology program, students will combine general psychology theories and research methodology in preparation for graduation. From conducting hands-on independent research and completing required clinical experience, third and fourth year psychology students will learn to demonstrate professional, ethical aptitude and choose a specialization. By this point, students enrolled in a bachelor’s level online psychology program have applied their lower division theory, research and experience to more advanced courses. It’s time to consider which psychology-specific courses interest them the most and choose an area of the field to focus and specialize in. Professional psychologists are expected to conduct inquiries to advance scholarship in the field. This is a great opportunity for bachelor’s level students to jump in and gain real-world experience. As higher level psychology students or professors conduct research, inquire about becoming a research assistant or apply for an internship with a professional research company or private clinical psychologist. This experience will come in handy as students begin work on their own research upcoming capstone coursework prior to graduation. As graduation gets closer, bachelor’s level students will want to start considering building a professional profile. For online students who may not get much face time with professors, it is especially important to make personal connections elsewhere. Professional psychology associations often offer student memberships and provide networking opportunities that can eventually help grads get a foot in the door for their first job. Nearing graduation time, bachelor’s level psychology students will have to put their knowledge to the test, calling upon values of informed consent, confidentiality and ethical responsibility to piece together a creative, insightful capstone project. This may include a private research project, or a component of a larger piece of professional research done during internships or job shadow opportunities. A realistic capstone project is key to smoothly transitioning into the workforce after graduation. From the day a student registers for their first semester courses until the last day of their online bachelor’s of psychology degree program, it’s vital to track the sequence of progress toward satisfying graduation requirements. These may vary by institution or degree specialization, and the prudent way to ensure completion is to work with an academic advisor or mentor in the undergraduate psychology department from the outset. Here are some benchmarks to watch for. All schools establish their own standards for academic standing. Most bachelor’s level psychology students are required to maintain a 3.0 grade point average or higher throughout their program to be eligible for graduation. Students who do not maintain at least a B grade in any major psychology coursework may be expected to repeat it for credit. Failure to complete the course in timely fashion may result in suspension. In order to meet their GPA and degree requirements, psychology students are advised to replace all failed or incomplete grades from their transcript. This can meet done by retaking courses and completing all necessary grade replacement forms. Once psychology students have met the requirements set by their online bachelor’s program, they should begin the graduation application process. Students should also meet with their academic advisor for completion confirmation. A bachelor’s degree in psychology represents the minimum academic attainment required for entry into most clinical and research professions. Following completion of their online degree, bachelor’s graduates can choose to continue on to a master’s degree, enter the workplace, or do both at the same time. Many positions require graduates to obtain state licenses to practice in clinical settings, but these entry level jobs are worth considering after earning a bachelor’s in psychology. Under the instruction of physicians, psychiatric technicians assist in client care regarding their mental and emotional needs. Some psychiatric physicians may also help administer medications and participate in rehabilitation treatment programs. State-licensed public school counselors help students achieve academic goals by addressing learning disorders, behavioral and emotional issues, and disabilities. They conduct assessments and testing, provide individual and small-group counseling, and help with career advice. Rehabilitation counselors work with patients experiencing psychical, mental, emotional and developmental disabilities. Rehabilitation counselors work in public agencies, counseling centers and in private practice to help individuals manage or resolve emotional/behavioral difficulties that arise from their disabilities. Bachelor’s level psychology students learn to master the techniques of verbal and written communication, from using client-sensitive methodology and field-specific terminology in record reporting to more informal interpersonal communications. Psychologists must learn to juggle focused written communication styles across a wide spectrum of audiences for reports, statistical studies, publications and presentations. Following the Scientific Method, bachelor’s level students learn to design research projects, gather data and accurately report their findings and conclusions. Students gain experience using qualitative and quantitative data employed in case studies, field experiments, surveys, cross-sectional studies and content analysis. Proper advanced research methodology is vital in conducting testing and experiments in psychology clinical settings and laboratories. Through electives or specialty study, bachelor’s level psychology students learn and practice skills used in a clinical setting. For example, aspiring school counselors will have completed instructional hours and clinical research including studies and student testing, assessment and intervention, while industrial and organizational specialized students would build skills in organizational training, workplace assessment, change management, cultural dynamics and the psychology of leadership. The APS (formerly the American Psychological Society) works toward the advancement of scientific psychology and professional education. Student members enjoy access to scholarship and funding resources, an annual convention, and the APS employment network. Membership in PSI CHI is based on student academic scholarship for psychology majors or through the campus chapter. Online resources include publications, research assistance, awards and grants, and career advising. As Division 53 of the APA, the society focuses on providing research and professional resources for the study and practice of child and adolescent psychology. Graduate students can join free of charge for the first year of membership and gain access to newsletters, career development assistance, grants and award programs.